The Schweizerhof is a family-run 3-star hotel offering modern living comfort right in the heart of Vienna and offers free Wi-Fi. 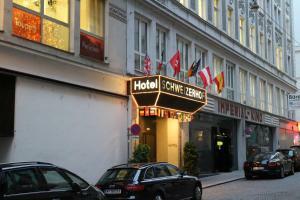 The hotel is popular with business travellers as well as families and private travellers, who are looking for a quiet insider tip in Vienna. From the hotel entrance to the TV room, in the breakfast room and the guest rooms guests will find fresh design combining elegance with Viennese charm. The reception is open 24 hours. Upon request, mobile fans are available for the rooms, at no extra fee. Staff are happy to provide you with tips and information on how to get the most out of your stay in Vienna. The metros U1, U3 and U4 stop 200 metres away.